I have a card to share today that I made for a few challenges. 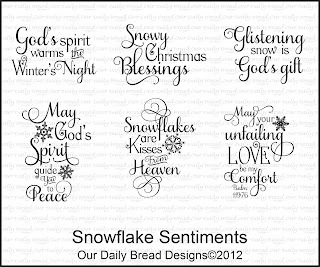 I used the Dec. release from Our Daily Bread designs: Sparkling Snowflakes and Snowflake Sentiments. 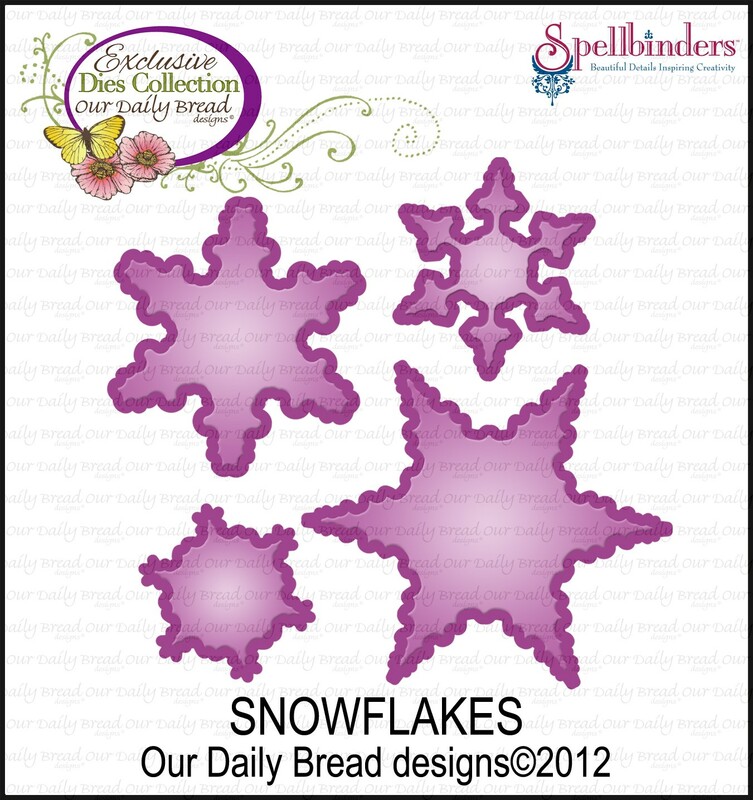 I stamped on vanilla card stock with Colorbox pigment ink and then clear embossed, and cut out my snowflake with the custom Snowflake Dies made for ODBD by Spellbinders. I also matted with Spellbinders 2010 Snowflake Pendant and Venitian Motifs. The embossing folder is a Darcies ef called Corner Scroll (ACMoore) and the pearl is Recollections. The little snowflake lacey strip is K&Co paper tape. I used the sketch from ODBD Shining the Light challenge. Thanks so much for looking! I love knowing you were here!!! my goodness...what a striking and wonderful card! 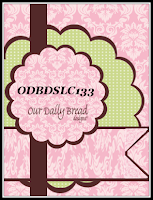 Grace: What gorgeous ODBD stamps. I am aways amazed at how all of you utilize these stamps SO beautifully. Such a talented bunch of designers, and I'm SO blessed that you share your lovely art in our challenges. Thanks for blessing us with this gorgeous creation this week. Have a blessed day, and please come back soon. Hi Grace Sweetie. So nice to see your card in the Word Art Wednesday picture pool. 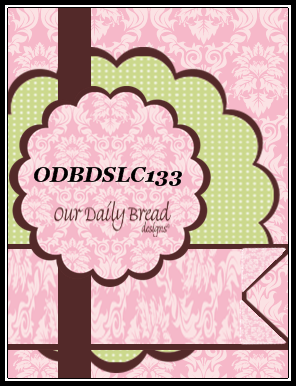 Love ODB stamps and haven't been there for a long time, but always loved seeing your amazing work. Your card today is no different. So beautiful and so bold. Love all that you share in our blogging world and your faithfulness to the Reason For The Season, shines through in every creation and post. Wishing you a Merry Christmas Sweetie. Big Hugs. Wow! Wow! Wow! Grace!! Stunning!! 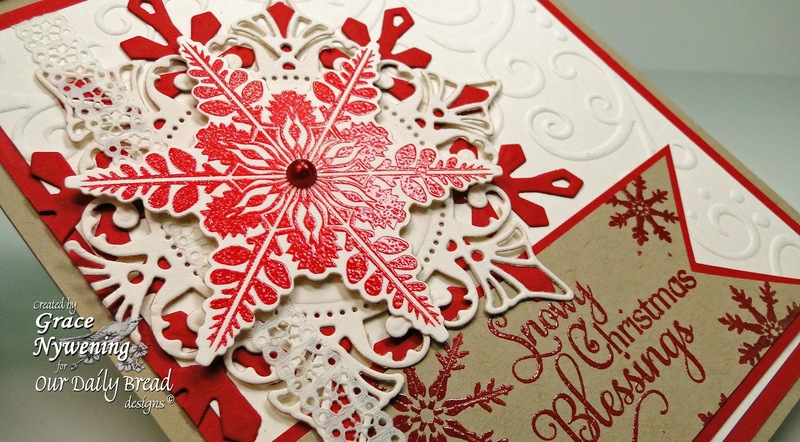 Love the red and white with all the embossing!! Gorgeous take on the sketch!! Love your use of dies and layering!! Thanks for supporting the Shining the Light challenge...love you girlfriend!! Gorgeous card. Love the red snowflakes. You used it beautifully. Oh Grace I love all the texture going on in this card - and the simple colours make that even more striking. Wow! The red snowflake is so striking. Such a beautiful card. wow... this is absolutely stunning, grace!! 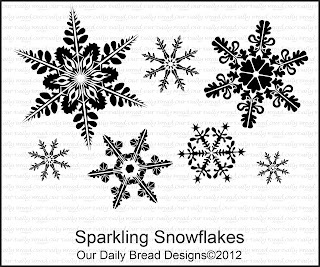 the layered snowflake is just amazing!!! So pretty, Grace! The bright red is so striking!!! 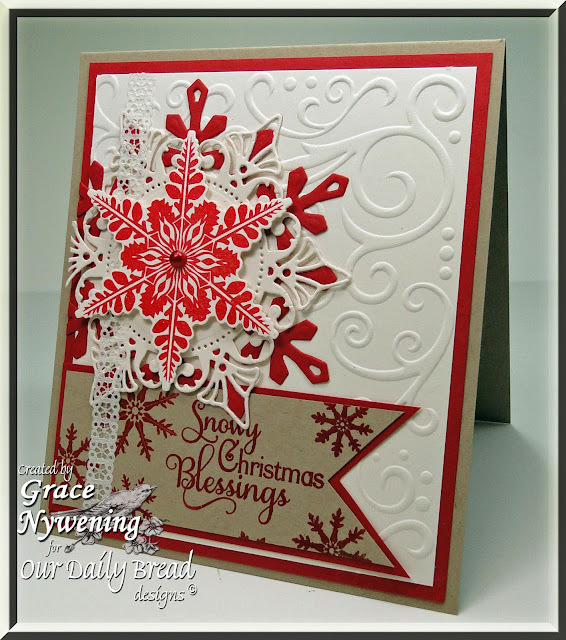 Lovely layering of the snowflake and the embossing folder is perfect with them! I'm CASEing this Grace. I love this card so much. It's awesome with the red and you really showed off the December release and we both love that too! So pretty! Love your red & white color combo with just a touch of Crumb Cake! Wow, what a fabulous card ! Love your colors and layout. Thanks for joining Crafts 4 Eternity this week. WOW, I love everything about this card, that gorgeous big snowflake and the beautiful embossed swirls. and then red and kraft look so sharp together. I'm so glad I got to see this card. It's beautiful. I'm going to "Pin It", it'll connect to your blog but if you don't want it pinned please let me know and I will remove it from my boards. thank you for sharing and playing with us at SFTW. Marvelous card, Grace!! I adore the white/red combo and layers of pretty! Lovely stamps and dies! Thanks for popping in and bringing me joy and smiles! Sending love and hugs to you and your family this Christmas season! Hi Grace! This card is simply GORGEOUS! Well done! Thank you for joining us at Fussy and Fancy for our, "I love Christmas" challenge! WOW! Your card is absolutely GORGEOUS! Love the embossed background, the various dies you used, and your sentiment is the perfect match! Thank you for joining our QKR Challenge this week. Hi Grace - I love love love your wonderful creation! We both played in the Stampin' for the Weekend challenge - my first time, and it's good to see a familiar face :) - Hugs and Blessings!